Originally hosted in 1891 at the Stade Francais club in Paris, this tournament was strictly limited to Frenchmen. Although women's events were included six years later, it was not until 1925 that the French Tennis Federation (FTF) decided to open the tournament to foreign players. Two years later, Jacques "Toto" Brugnon, Jean Borotra, Henri Cochet, and Rene Lacoste, who later became known as the French Musketeers, accomplished one of the best victories in French Tennis history. 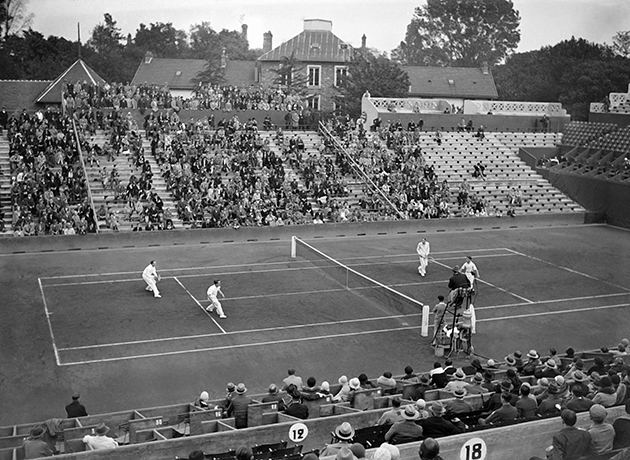 The assumed underdogs and famous foursome won the Davis Cup on American turf, which led to a rematch in 1928 hosted in Paris. Because of tennis' growing admiration, this match called for a new stadium; Stade Francais handed over three hectares of land to the FTF and named this newly-built stadium in honor of one of Stade Francais' most renowned former members: Roland Garros, a famous World War I Aviator. Here, the Musketeers took center stage only to triumph over the Americans in yet again. It was this rematch in particular that helped the Musketeers establish their prestigious reputation. ​The late 1900's marked an exceptional era for tennis in general at Roland-Garros. Centre court hosted the unparalleled Bjorn Borg in many of his breathtaking matches; and other master-minds of the game: Ivan lendi, Mats Wilander, Gustavo Kuerten, Christ Evert, Stefi Graf, and Martina Navratilova, also added to the prestige of the French Open Championships. More recently, Spaniard Rafael Nadal has dominated the 'terre battue' at Roland Garros, lofting his name amongst not only one of the all time greats on clay, but overall as well. Recognized as one of the most spectacular tennis events, the French Open is fully entitled to its esteem as the world's premiere clay court event.